Whether it’s from Scratch, or you are Converting a Level 10 NPC, it is very important to build your cities correctly. A captured Level 10 NPC that has had 13 Cottages, Stable, Forge, and Workshop demolished and has had 16 new Barracks built..
A city built from scratch with all level 10 Barracks. Remember: You will need your Workshop and Stable to finish your Wall and Relief Station, as well as your Forge to upgrade the Workshop, so DO NOT demolish your WorkShop, Forge, or Stable until your Walls and Releif Station are level 10! 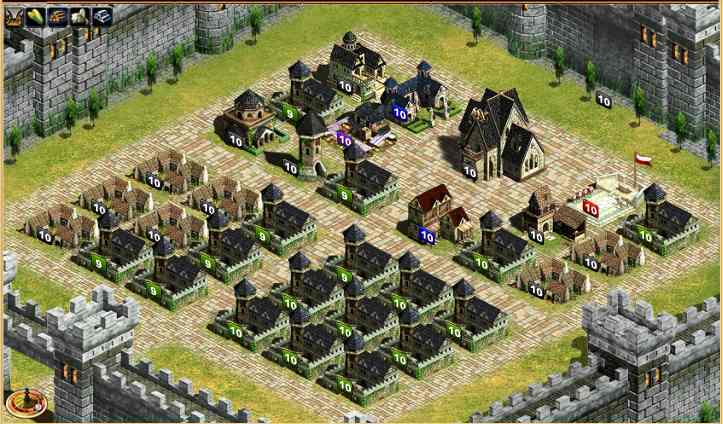 Also, depending on your troop Training Hero’s attack level, you may want to add or subtract a couple cottages for more or less barracks – as your heroes start building troops faster more population is needed for building warriors and scouts because they build so fast. Note: The cities above DO NOT have Warehouses – if you are prone to defending, you may want to keep at least two Warehouse in each of your cities. All cities should have ALL of the same resource fields and valleys as whatever is most expensive at the time. Usually Stone is the most needed/expensive resource to have on a new server when players are building up cities more than anything else, but Lumber and Iron always end up being the most sought after Resources. So why waste time and resource fields making a Resource that is worth half as much as another? All it takes is 30 minutes to sell your Lumber and buy over Twice as much Food in exchange – plus still have Lumber left over!. The only time your cities should have mixed resource fields is when they are feeder/alt cities running a 19/21 split for more safety! Another thing to consider when building the Perfect Evony City is LOCATION. Is your city going to be a support/farming city? If so, then try to find a spot with lots of Flats directly next to the Flat you are going to build on or the Level 10 NPC you are capturing. The reason behind this is so that you can fill up the surrounding nearby Flats with Level 10 NPCs to farm, and for the flats that are over 5 miles away with Level 5 NPCs. 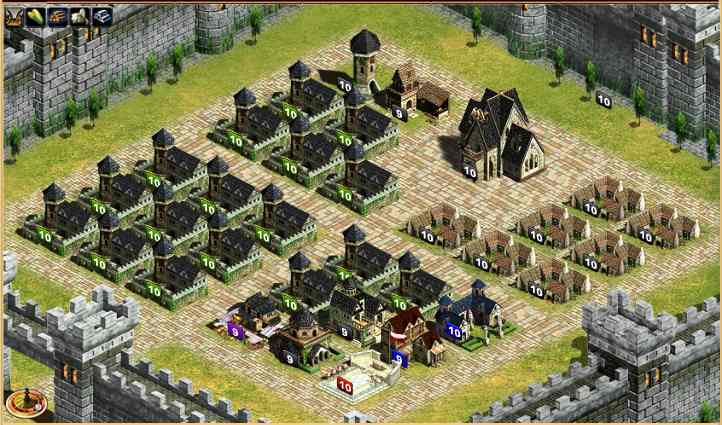 Is your city going to be a main/war city with lots of resources and troops? If so, do the exact opposite as you would for a support city – find a flat or npc to capture that has very little other flats/npcs/cities directly next to it – a city completely surrounded by just valleys is the safest type of city. Why? Because hostiles can’t put multiple cities 1 mile from your city to attack, they must do it from at least 2 map spots away! This should help you in your endeavours to create the most Productive, Perfect Evony Age 1 city. Don’t forget to bookmark this post for your future reference!